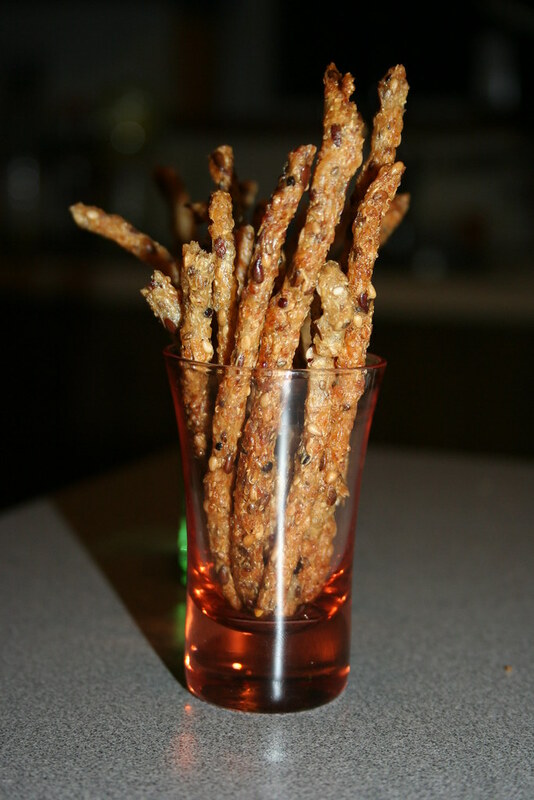 I have mentioned in the past about my love for Mary’s Gone Cracker’s Sticks & Twigs pretzel sticks. At the time, it inspired me to create these crackers. From the moment I tasted these awesome pretzel sticks, I was determined to figure out a way to make them that would cost less than the $4+ to buy the bags. I had been studying the ingredient panel and studying (and eating) the bagged pretzel sticks. I have finally come up with a solution! And they taste even better than the bagged variety (according to my 10-year-old taste tester)! It has a similar ingredient list to the wonderful crackers and are similarly adaptable to other flavors. You can add herbs or sauces to infuse them. I usually just like a simple sea salt flavor or maybe some rosemary and thyme added to the mix. Nothing too complicated. Since we are doing this by hand, unlike the store-bought, the consistency comes out a bit different than the bagged variety. In many ways, I prefer the homemade version better. Cook the millet, amaranth, quinoa and brown rice as stated on the package directions. Add cooked brown rice to Cuisinart and process with a small amount of water. You should process brown rice to a mush. Add the quinoa, millet and amaranth and process a bit more to incorporate. Do not pulverize those grains though. You want them to stay mostly whole. Transfer the mixture to a large mixing bowl. Stir in the tamari, salt, pepper and various seeds. Let sit a few minutes. Fill up a piping bag with some of the mixture. I found that a piping bag works best, but you could use a heavy duty ziplock bag if that’s all you have. I used a disposable piping bag and cut off a small tip. Should be about a 1/2″ in diameter if you are using the piping tools. If it’s too thick, it would crisp up well. Brush your baking sheet with vegetable oil. Pipe the mixture on to the sheet in sticks. You can do long or short sticks. Bake for about 10-12 minutes and flip sticks over. Bake another 10 minutes or so and transfer to a cooling rack. You will want to check on the pretzel sticks often to check for doneness. You don’t want them to burn, but there is a small window between too soft, done and burnt. When done, store in an airtight container or bag. Enjoy!